When lubing your chain, drip the lube onto each individual roller instead of just applying a stream along the entire length of the chain. Lube does nothing for the outside of the chain; it only works to reduce friction and keep dirt out of the inside of the rollers. Be sure to run a rag over the chain after letting the lube set for a while. 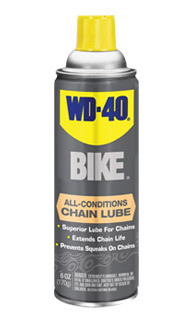 Any lube left on the outside of the chain will be a magnet for dirt and grime.